One of the new features introduced by Asus with the new round of motherboards for the mainstream Intel CPUs was the ability to incorporate thermal readings of a user installable thermal probe for its monitoring and fan controlling software. Not all motherboard supports it and not all of them came with the thermal probe even if supported. Only the highest end boards came with the probes. Despite my Maximus VII Gene board being the highest end Micro ATX board made for this platform by Asus (or any other vendor for that matter), it didn’t came with the probe. Sadness, but at least it indeed supported this feature. When I was moving the system from the ATX case to the Micro ATX case the other day (read all about it here), I came across an extra thermal probe that came bundled with the old Scythe fan controller that I had been using a while back. I had already sold the fan controller via Rakuten Auctions (because I moved from it to the Fan Xpert software on Asus boards) without bundling it up. Well, there is nothing I could do about it now, but I wanted to see if that particular probe was compatible with the motherboard. Now, temperature of which component should it sense? I thought about the temps cooling plan of the case, and there was only one obvious candidate. The video card. The side intake towards the front of the case was simply pumping fresh air in for the video card. It doesn’t have to run at all, if the video card is idle. So I figured that I could control the fan speed of that fan according to the video card’s temperature. The top intake and the rear exhaust were directly associated with the CPU anyways. 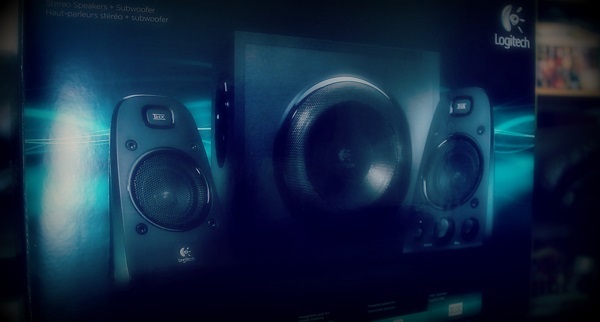 Almost 2 years ago, I bought the Logitech Z623 speaker set to replace the Corsair SP2200 speakers that developed a crackling issue in the subwoofer (read “RMAing Corsair SP2200 speakers in Japan” and “From crackling Corsair SP2200 speakers to Logitech (Logicool) Z623 speakers”). I bought it from Amazon because they had it for the cheapest offer. It cost me a little under $90 although it should have cost me about $130 if I bought it directly from Logitech as that was the MSRP. However there was one issue with this particular set. Many of the end users were complaining about a defect with the power button. The speakers would turn on and off on its own at random times. Not everybody was having this problem so I thought I might get lucky. Even if the problem developed in mine, I would not have a problem with RMAing as Logitech’s customer support is superb. After about one year of usage, the problem developed on my set as well. It was not irritating at first as it would only appear - if at all - at the time of powering up the speakers. But eventually it got worse up to the degree where it would lose power while watching a movie even. A few days ago I bought the Silverstone Heligon HE-01 cooler to replace the Antec Kuhler 620 closed-loop water cooling unit that I had it my rig temporarily. The cooler performed well at first, but then its fan went bad. I ordered a replacement for the cooler. That fan worked fine. Or at least, it could run at full 2000RPM as advertised. But as this is a PWM fan, the motherboard would change the fan speed with respect to the CPU temps. I kept it at "Standard" fan speed profile in Asus UEFI. When the CPU wasn't stressed, it was reasonably quiet but still nowhere as quiet as I would have liked. Then I had to think about the CPU temps too. My 4790K CPU would run extremely hot even while doing a not-so-extreme h.264 transcode. After I bought the cooler, the PC underwent a significant change. I got a new case for the PC and it was substantially smaller than the old case which allowed me to move it to the top of the desk. While the fan noise was OK when the case was located under the desk, it was intolerable once moved into the new location. This made me lower the fan speed setting to "Silent" profile for the day to day tasks. Now the fan speed would have a wider range of speeds. It would still reach full speed if the temps exceeded 75C (there is no way to override this behaviour) and now there was a bigger chance of that happening because the low fan speed causes temps to be reasonably high even at low loads. Finally it seems that someone wanted to grab my Raven RV03 case. I had to have it displayed on Rakuten Auctions for a while though. I was not certain that I would be able to get rid of it because nobody wanted to bid for it despite the super awesome initial bid value I set for it. The bidder has already paid for the case, which means, it is a definite go. My Small Form Factor build is actually happening after all. This is just great timing really. My kid is just about to start crawling, and I definitely cannot allow him easy access to the PC (because he might bump his head on a sharp edge on the case) or the cables (there is no doubt that he would want to chew them and see) lying on the floor. First things first. I have to ship the case by Friday, August 8. Before that, I have to order a new case as soon as possible and transfer all the components from the old case to the new case. That is going to be tedious, especially when my son never naps for more than an hour straight during the day time. In addition to that, I would be very busy during this weekend which means I cannot get my hands dirty as soon as the courier service delivers the case. Not happy!